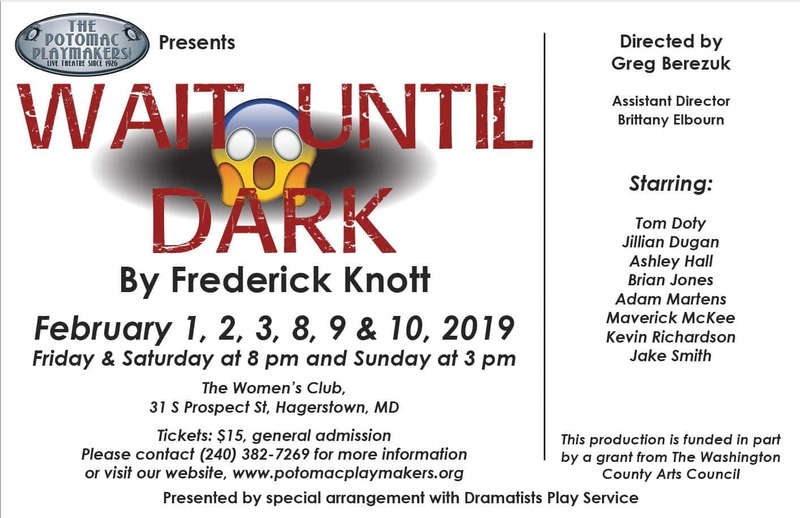 The Potomac Playmakers announce the third show of the Playmakers’ historic 2018-2019 season, the classic Frederick Knott thriller “Wait Until Dark!” In the play, the central character is Suzy, who was recently blinded in a car accident. The action takes place in the New York basement apartment of Suzy and her husband Sam, who is a photographer. A group of murderous thugs believe that Sam and Suzy are in possession of a doll that contains very valuable contraband that was smuggled in from Canada. With the help of the young girl who lives upstairs, Suzy must do her best to outsmart the criminals in order to save her life! Produced with kind permission by Dramatists Play Service and funded in part with a generous grant from The Washington County Arts Council , “Wait Until Dark” is directed by Greg Berezuk with Brittany Elbourn, and stars Tom Doty, Jillian Dugan, Ashley Hall, Brian Jones, Adam Martens, Maverick McKee, Kevin Richardson, and Jake Smith. “Wait Until Dark” will be performed February 1, 2, 3, 8, 9 & 10, 2019 at The Women’s Club, located at 31. S. Prospect Street, Hagerstown, Maryland 21740. Showtime will be at 8:00 pm for the Friday and Saturday performances, while the curtain will rise at 3:00 pm for the Sunday matinees. Tickets are $15, and are available at the door or online at www.potomacplaymakers.org. 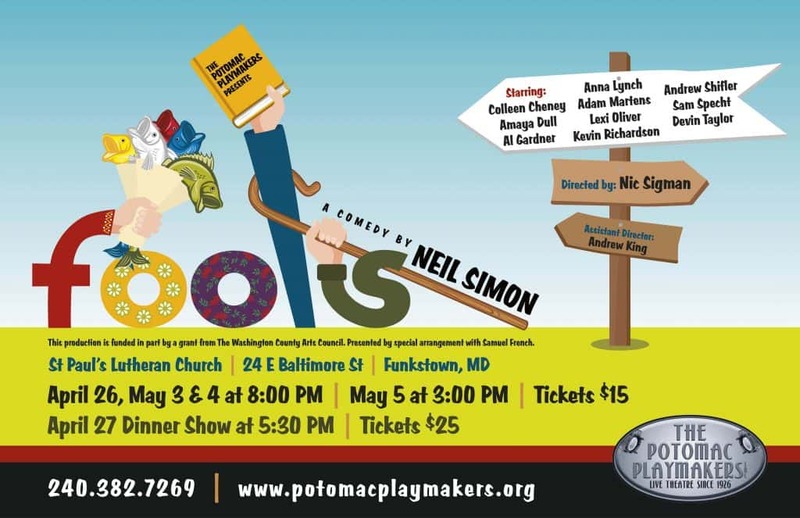 The Potomac Playmakers, founded in 1926, is one of the nation’s longest running active community theatre groups. For more information, visit The Potomac Playmakers’ website at www.potomacplaymakers.org , email potomacplaymakers@gmail.com or call (240) 382-7269. Potomac Playmakers, Inc. is a registered 501(c)(3) all-volunteer, non-profit community theater company in business since 1926.